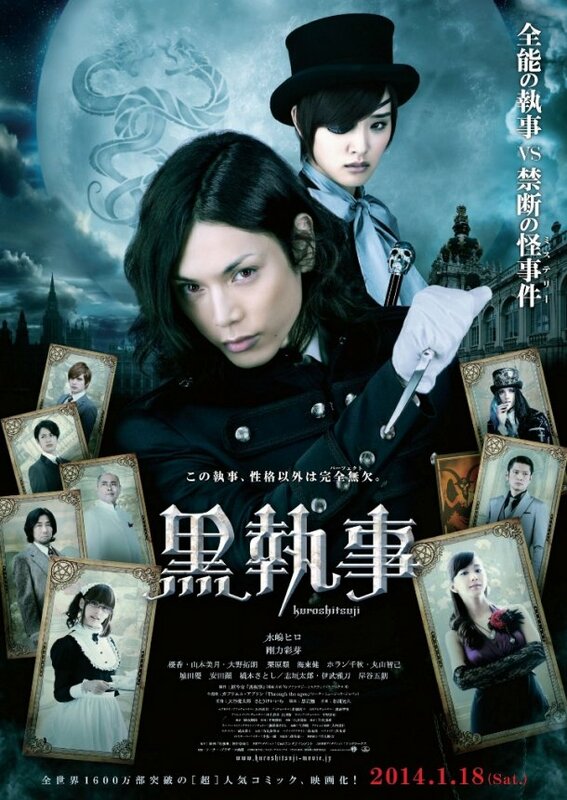 Mizushima Hiro as Sebastian Michealis, the "Black Butler"
Synopsis: Set in the year 2020, Shiori Genpo (Ayame Goriki) runs the large corporation Funtom. Shiori is a descendant of the prestigious noble family Phantomhive of England. As a descendant of the noble family Phantomhive, Shiori solves difficult cases which are ordered by the queen. In order to take revenge on the murderers of her parents, Shiori makes a deal with the demon Sebastian (Hiro Mizushima). Their deal involves Sebastian protecting Shiori and caring for her as a butler until her revenge is fulfilled in return for Shiori's soul. Masich Review! : I enjoyed this Movie, it a is as normal as any other Japanese movie..of the same genre category that is^^. I honestly do not understand what the fuzz was all about? Yes it is different then the Manga and/or Anime, yes Ciel has been switched with a other person and is a girl. Why do people keep comparing adaptions with its original source? In this case and example the manga. Yes it does follow a different story then that it is based on, But it's not written in stone that it should be! As for me, I base every single version on its own. Manga, Anime, Live-action. Each of them should be rated on its own. same counts as for what I do with a lot of Animes based on a manga, of course I feel confused for the 1 being different then the other, but you still have to see it from its own side. that will be all^^, I myself give this movie a 8 out of 10. Do not compare adaptions with other adaptions or other sources, Please see them as individuals. Edited by Masich, 10 December 2014 - 12:49 AM. Great anime with beautiful artwork, a very laid back relaxed anime to watch, full of funny moments and outrageous lines from all characters. Some dark moments are very serious for story telling, but all in all its a chilled out anime with a good story, that has a lot of charm. A couple characters have weird voices and you can tell its an American doing a British accent but you do get used to it and its not noticeable after an episode or two. Loving this anime, great humour, great story, GREAT CHARACTERS. On Hanggang saan it's overall a great anime that I give 9/10. If I give it any lower im scared Ciel will send Sebastian after me.